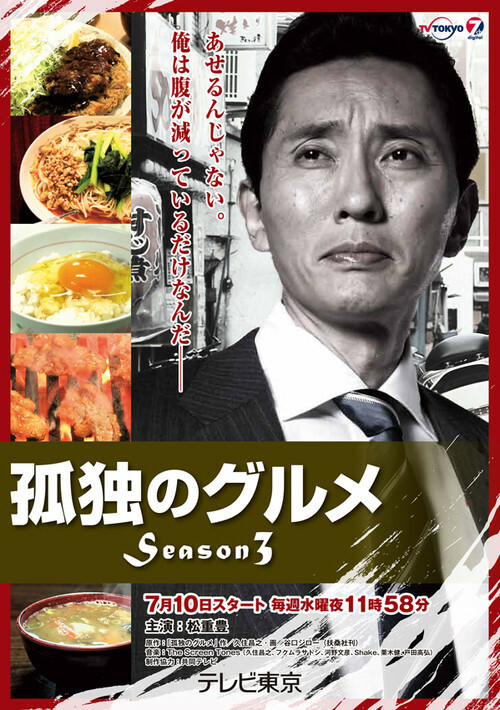 Kodoku no Gurume ~Season 3~ (Tokyo TV, Summer Edition 2013) is the third installment of the live adaptation of Qusumi Masayuki and Taniguchi Jiro's manga about a tall merchant named Inogashira Goro (Matsushige Yutaka). Goro goes all over Tokyo and surrounding cities during his business travels, while indulging in local cuisines and sweets along the way. At the end of each episode, Qusumi will also visit the featured shop, in his usual segment, "Furatto Qusumi." Final Ep. 12: "Sardine yukhoe and Nigiri-zushi at Ooimachi, Shinagawa Ward"
Episode Synopsis. Goro travels to Niigata Prefecture in his BMW. The rice fields and pastoral scenery make him look forward to eating a rice-based feast after his meeting. He also stops by a shopping street in the station area and tries out some delicacies with names taken from local expressions and phrases. Later, he visits an unusual old house turned into a work of art. There he meets with the town's fun activity planner, a small hairy man with an unlikely name. Later, Goro views the terraced rice fields, reminding him of his other purpose. He drives around until he spots a roadside diner called "Toge no chaya Kura" which serves kamameshi (rice in a pot) dishes and stews. Ep. 10: "Flaming Sake pot and Barley Rice with grated yam of Nishiogu, Arakawa Ward"
Episode Synopsis. Goro sets out for an amusement park in Nishiogu. He meets with a client, the director of a train museum. Goro finds his enthusiasm for trains and intolerance of children who play with his train models quite amusing. Later he spots a takoyaki shop and buys a takoyaki-senbei sandwich. Later he uses the town's streetcar and helps out an old lady carry her defective rolling luggage to a neighborhood he has not seen before. There, he decides to eat at a tonkatsu shop. Despite the hot weather, he orders a flaming sake hot pot, barley rice, and of course a mini-tonkatsu set. Ep. 9: "Roast pork sandwich and Salsiccia of Kotake Mukaihara, Nerima Ward"